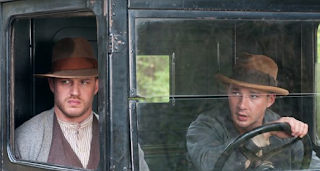 Lawless is based on a novel by Matt Bondurant called The Night Swimmer and more loosely based on the true story of three outlaw brothers - Forrest, Howard, and Jack Bondurant - who bootlegged liquor under the noses of the authorities in Franklin County, Virginia during Prohibition. I am told the dramatization of the film is remarkably in line with the novel and family lore. 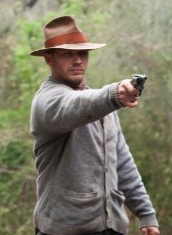 When oldest brother "Forrest" (Tom Hardy) first starts friction with local law enforcement over his refusal to share some of the funds from their illegal business, "Special Deputy Charlie Rakes" (Guy Pearce) makes it personal in his quest to punish any and all lawbreakers who refuse him. When Forrest is injured in a surprise attack from two men, young "Jack" (Shia LaBeouf) steps into position to head off further opposition, with his older but less capable brother "Howard" (Jason Clarke) playing second fiddle. But with no experience dealing with the law, organized crime, or staying off the wrong turfs, young Jack will have to grow up quick. The efforts of he and his brothers will go towards starting a war that will endanger everyone in their lives, including Jack's young, churchgoing love interest "Bertha Minnix" (Mia Wasikowska) and Forrest's "Maggie" (Jessica Chastain) who are of many within a few miles of would-be peaceful mountain towns who stand to lose their very lives. Now Lawless is everything the title reflects that it should be. In fact, that's nearly all it is. In a rather lifeless and lazy setup, the less-than-engaging tempo and un-energized plot shows us very quickly that it has little if anywhere to go beyond demonstrating the consequences of a world of extreme crime and cruelty. The dark and dank settings, the shootouts, the greed, the portrayal of the worst of human nature is what repeatedly chops down any attempts to showcase any other side of what human beings are capable of. For this reason, even the good and great performances on the part of LaBeouf, Chastain, and Hardy, and in particular, by Gary Goldman as "Floyd Banner," cannot by themselves make us root for the bad (or good?) guys. We're supposed to be paradoxically betwixted by law enforcement that is more corrupt than the outlaws, and from there, draw the line with the outlaws falling on the good side. But we've long since had a look at history and seen that Prohibition was a such a grievous mistake, so it should be easy to make the outlaws the good guys. But these are very, very violent and bloodthirsty good guys. Caring for them even a little bit more than the corrupt lawmen is itself a serious challenge. We needed to see the other side of human nature, and the problem with Lawless is that we see so little of it; the picture never opens up enough to win us over. The result is a lot of blood and killing and sadness and grief, but none that welcomes us to feel for it like each loss should have mattered to us. When we aren't seeing narrow characters (like Pearce's effective but fever-pitch Rakes, for instance), we are made to wonder how the local riffraff ever expected to stay ahead of the law when they clearly never exhibit much logical thinking or do much planning on staying undetected. When attacks on officers of the law and sieges and beat-downs aren't projecting massive egos, we are left with a story that never even once tries to surprise us with anything outside of its gruff and predictable savagery--we can almost always see the next ambush coming. The result: A movie that follows an identifiable intro, body, and conclusion while trying to offer a little bit of history and wisdom in the same shot. And it's not all lost. 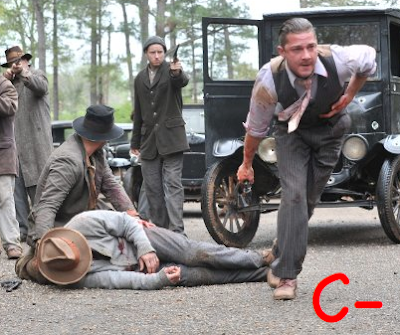 Lawless isn't a bad movie, but given its high-power and dedicated cast, it's just not hitting the numbers it needs to hit. Lawless might be one of those films where audiences will gravitate to it more so than the critics, but in my opinion, this doesn't change its hopelessly mediocre status. When we reach the end, we find that we walk away without anything more than what we went in with.